All glitches are not created equal. Some are game-breaking, but others can be kinda fun. Some can even be both. You've likely seen YouTubers racked by spasms of scream-laughter at them. Activision's been taking down videos of certain glitches, much to the chagrin of some. 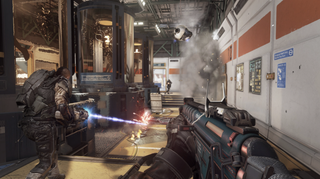 Video network Machinima says Activision has been more trigger happy than usual about flagging YouTube videos for possible copyright strikes if they involve Call of Duty: Advanced Warfare glitches. Machinima first took notice of the trend and sent word of it around to their talent network. YouTubers and players alike are not happy, despite Activision's claims that they're only targeting glitch videos that focus on cheats and exploits. Now, this hasn't been a unanimous thing. A quick search on YouTube reveals that there are still quite a few Call of Duty: Advanced Warfare glitch videos available for your viewing pleasure/schadenfreude. However, Activision is keeping an eye out for a certain variety of glitch video, they say. In a statement sent to Kotaku, Activision claimed that they're only going after videos that could help others cheat or take advantage of the game's... less polished elements. "We're excited that so many fans are having fun playing the game and posting videos of their gameplay. We love watching the videos ourselves. Occasionally, some folks post videos that promote cheating and unfair exploits. As always, we keep an eye out for these videos—our level of video claims hasn't changed. We are appreciative of the community's support in helping to ensure that everyone has the best playing experience possible." 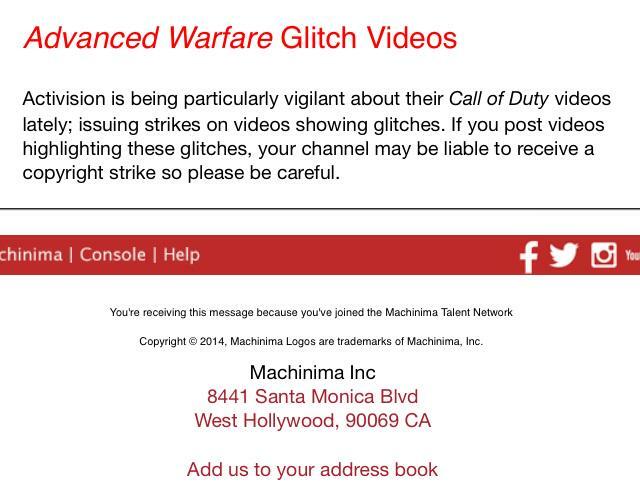 "Recently Machinima notified it's network partners that posting content about Call of Duty videos may receive a strike if flagged by Activision. Machinima was prompted to take this action in order to inform its network partners so that they would remain in good standing on YouTube. When a channel receives a certain number of strikes it is possible that they may be blocked as a YouTube partner. Machinima's actions are to protect not only its network partners, but its publisher partners as well." Strikes are bad news for YouTubers, and they can be easily abused by big companies in cases where they don't like the way their game is being portrayed. Not only do YouTubers lose the video in question, they also lose access to key YouTube features. On top of that, YouTube adheres to old baseball rules: three strikes and you're out. Permanently. No more YouTube account. For people who've spent years slaving over a white-hot video editor to build an audience, losing all that in the blink of an eye simply isn't an option. It's understandable that Activision wouldn't want people poisoning its multi-million dollar techno-thriller well with cheats and exploits, but perhaps YouTube flags/strikes aren't the best way to deal with that. YouTubers stand to lose a lot for what is, in the grand scheme of things, very little.